From the award-winning author of The Summer Bride comes the first in a charming new historical romance series where marriages of convenience turn into true love matches. Major Calbourne Rutherford returns to England on the trail of an assassin, only to find he's become Lord Ashendon, with the responsibility for vast estates and dependent relatives. Cal can command the toughest of men, but his wild half-sisters are quite another matter. They might just be his undoing. 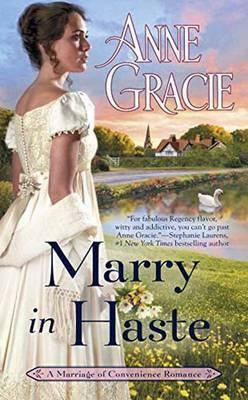 When he discovers that Miss Emmaline Westwood, the girls' former teacher, guides them with ease, Cal offers her a marriage of convenience. But strong-minded and independent Emm is neither as compliant nor as proper as he expected, and Cal finds himself most inconveniently seduced by his convenient wife. Emm knows they didn't marry for love, yet beneath her husband's austere facade, she catches glimpses of a man who takes her breath away. As pride, duty and passion clash, will these two stubborn hearts find more than they ever dreamed of?